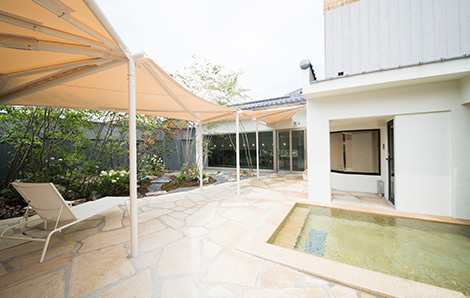 the onsen (hot bath) plays such an integral part in everyday life. One of three historical onsen towns in Okayama, Yunogo onsen is said to have been discovered 1200 years ago by a high priest who saw an injured heron soaking in the water. We offer four bath houses within our establishment for your comfort and relaxation. The various minerals in the water are thought to aid the healing process of a range of ailments, such as aches and pains and more serious complaints including skin problems, rheumatism, diabetes, menstrual disorders and so on. The water of Yunogo has a high sodium chloride content, is colourless, without odour and soft on the skin. Recommended for more peaceful and private time with your loved ones. Both the elegant rock bath and the local granite bath provide seasonal garden views, comfortably accommodating four adults each. 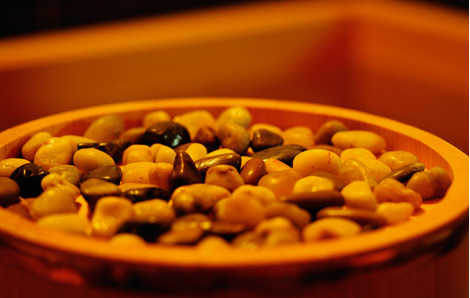 Our sauna comes equipped with 13 kinds of natural mineral stones whose qualities radiate a healing power, which can be effective for skin cleansing, detoxification and general wellbeing. Public baths for women constructed of local Japanese cypress.